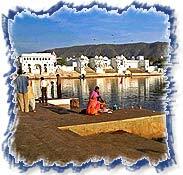 The colourful town of Pushkar is known for its sanctity, colours and elaborated rich culture. Pushkar Festival Tour presents the flavour of the city with camels, competitions, fascinating folklores all enhancing the essence of being in the golden Thar Desert. Delhi by international flight. Meeting and assistance on arrival and transfer to the hotel. Afternoon sightseeing tour of Old and New Delhi. Drive to Agra and on arrival, check-in at the hotel. Afternoon sightseeing tour of Agra and Taj Mahal. Drive to Jaipur visiting enroute Fatehpur Sikri. On arrival, check-in at the hotel. Morning visit Amber Fort and elephant ride to ascend the fort. Afternoon city sightseeing tour. Drive to Pushkar and on arrival, check-in at the Deluxe Tent or Hotel. Rest of the day explore Pushkar Fair. Day at Pushkar to witness festival and cultural activities. Spend another day witnessing the festivities at this fair. Transfer to Jaipur airport to board flight to Delhi. On arrival, transfer to international airport for onward flight.